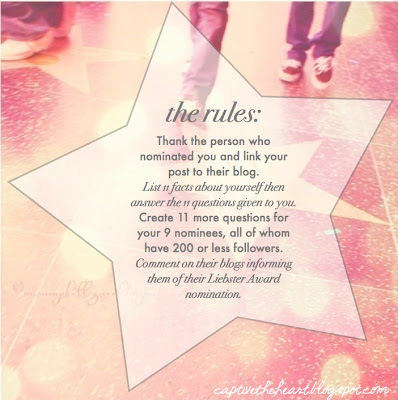 I had a really pleasant surprise the other day when Stephanie of I found him whom my soul loves commented that she nominated me for a Liebster Award. How nice of her! Thanks, Stephanie! 1. My hair is naturally curly but it was not curly until I was a teenager. 2. I have more of a savory tooth than a sweet tooth and most of the time I'd probably rather get an order of wings or nachos than that fabulous cake on the menu. 3. I lost my engagement ring on my honeymoon so I have been without it longer than the 8 months I did have it. 4. I absolutely love corgis! 5. I have lupus nephritis, an autoimmune disease that affects my kidneys. 6. I volunteer at a center for women with unplanned pregnancies. 7. I'm a nurse and this summer I will finally earn my bachelor's degree! 8. I met my husband when I was 10. 9. I am becoming Catholic this Easter. 10. Every time I wash my hands I sing "Happy Birthday" twice to be sure I wash long enough and the name I use in it is my friend who died when I was in high school. 11. I earned my Gold Award in Girl Scouts, the highest award possible, equivalent to an Eagle Scout. 1. What is your favorite city, state, or country you've ever been to and why? This is really tough and a question I get ask constantly now. I think my favorite country I've been to is Italy, but my favorite trip was to London or Paris. 3. What is your favorite Bible verse or passage? Spelling or grammar errors in published, edited work. 6. What is most misunderstood about you? Oh, so many things...maybe that I'm a bit shy? 7. Who is your favorite Saint and why? St. Anthony because he always seems to come through :-) He helped me find my library book in second grade and we've been buds ever since. 8. What is the scariest or most adventurous thing you've ever done? Wow, I feel really boring because the best thing I can think of is ziplining? A lot of people do that. Moving to a foreign country without speaking the language and not returning to the US for the better part of a year might count. But I guess it never seemed like it was scary or all that adventurous of me because I had my husband. 9. What is your favorite TV show from the '90s? 10. What is your favorite thing to cook? Feel free to include a recipe if you'd like! Bread, because it smells great and my husband LOVES it. 11. What made you laugh the most this week? 1. What is your favorite season of the year and why? 2. How many siblings do you have? Brothers or sisters? Are you the youngest, oldest, or in the middle? 5. What is the most unusual illness or injury you've ever had? Were you in the hospital? 6. What is your favorite kitchen appliance? 7. What is the last song you sang out loud? 8. If you had to eat at one fast food restaurant for the rest of your life, what would it be and why? 9. What do you most hope readers will take away from your blog? 10. What is one brand to which you are loyal and why? Fact #1: my hair is naturally wavy but this also didn't happen to me until high school. Fact #4: SAME! Corgis are my all-time favorite dog and one of my friends used to send me random pics of corgis to cheer me up. #6: I want to do this someday! And out of the answers you gave to my questions: #5 is also one of my pet peeves, I love your answer to #7, and hands down #9 is the same for me, too. I have most of the Boy Meets World seasons on DVD and still watch them. Oh, I guess I should just answer the questions as cleverly as possible. :-) I'm working on it.